Feel the "Force" with Disney's new virtual-hug jacket. Have you ever wondered what it feels like to be punched in VR? Me neither. Well, you may get your chance anyway. Because Disney — the company behind your favorite childhood movies like The Lion King and Tarzan — has teamed up with MIT Media Lab and Carnegie Melon to make this a real thing. 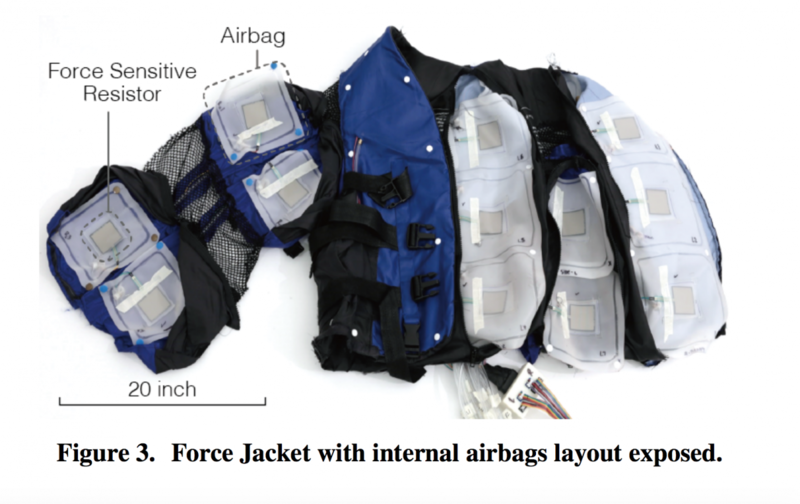 By hooking up 26 independent airbags inside a modified life vest, the team created what they call the “Force Jacket” — a jacket that can simulate perceptions of a “snake moving across the body” or a “hug.” We couldn’t make this up if we tried. 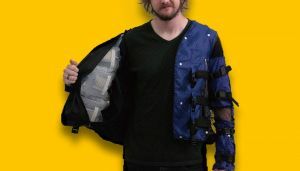 As a result, the Force Jacket can simulate the gentle tapping of raindrops, or a heartbeat sensation by actuating the airbag near the chest. The team even goes as far as differentiating between “adult” and “child” hugs (or “Enclosure,” to use their terminology). How lovely! There have already been countless attempts at trying to make virtual reality feel even more real by simulating sometimes delicate physical sensations. There’s the Sense Glove that makes it feel like you’re holding a physical object, and even entire tactile suits that let you “feel” subtle sensations via vibrations. But as far as we can tell, this is the first time that airbags — not electrodes or vibration motors — have been implemented for the purpose. But VR headsets are still not exactly mainstream, in part because they are still too expensive (and with limited utility) for many. So it might be a while before sensory VR accessories hit the shelves. Disney’s Force Jacket is far more likely to turn up at one of their theme parks or in a theater first. But can something like the Force Jacket ever take off? Honestly it’s a little strange. I really prefer to only have my arm squeezed by a bag of air when medically necessary, like having my blood pressure taken. Besides, a real hug is gonna feel better than one from a weird air-filled vest approximately 100 percent of the time. Will it improve on gimmicky “4D” cinematic experiences at Disney World? I don’t see why it wouldn’t.